Presentation of Book at the Forum of: Carnegie Council; The voice of Ethics in International Affairs. JOANNE MYERS: Good morning. I’m Joanne Myers, Director of Public Affairs Programs. On behalf of the Carnegie Council, I’d like to welcome our trustees, members, and guests to our breakfast program. Today I’m delighted that our speaker is Ambassador Heraldo Muñoz, the Permanent Representative of Chile to the United Nations. He will be discussing his most recent book, The Dictator’s Shadow: Life Under Augusto Pinochet. I know that after reading his CV, which was handed out to you earlier, you will agree with me that his rich and vast experience has brought a certain level of expertise to his posting which has benefited the entire UN community. Throughout its history, Latin America has been a breeding ground for dictators. One of the most infamous examples is Augusto Pinochet, whose name is synonymous with torture, greed, and the death of thousands. After a bloody coup in which he overthrew the elected president, Salvador Allende, General Pinochet ruled Chile from 1973 to 1990. Many justified his rule as a way of rescuing Chile from the threat of dangerous ideologies. These supporters saw his regime as a bulwark against communism and as a testing ground for University of Chicago-inspired economic theories. Others saw Pinochet as a symbol of 20th-century cruelty. The brutality that brought Pinochet to power and characterized his 17-year reign contrasts remarkably with the unmatched economic gains that created the most prosperous economy in Latin America. This duality raises many agonizing questions about his legacy. For example, was Pinochet a national hero or the embodiment of inhumanity? Could Chile have reached its present prosperity without him? As the story of Pinochet’s rise and fall reflects the broader history of U.S. relations with Latin America, we might ask whether interventions by foreign governments have ever had their intended effect and whose interest they ultimately serve. But perhaps the most poignant question of all, and the one which all else depends upon, is, was Pinochet really necessary? Do the ends justify the means? These are just some of the questions lingering in the minds of many Chileans today and are among some of the more disturbing issues that Ambassador Muñoz astutely addresses in his fascinating memoir. Our speaker views this painful period through an unusual lens, as he had to revisit a page of history that he had already turned. Yet this personal testimony of the rise and fall of General Pinochet and the role of the United States during this era serves as a reminder of a period in history that cannot be ignored nor forgotten, for it also shows just how far Chile has come since that time. Ambassador Muñoz is an insider, a perceptive observer, who, as a former revolutionary in the earlier part of his life, fought the Pinochet regime clandestinely and, later, in open opposition. He takes advantage of his unmatched set of perspectives to evaluate life under an authoritarian ruler, and in so doing, he shares many surprising insights about international relations, national politics, and human nature. The challenges facing 21st-century democracy can best be dealt with by examining the realities of the past. In telling the story of Pinochet’s reign, Ambassador Muñoz explains what this extraordinary figure meant to Chile, the United States, and the world. Even more, it is a lesson of what democracy could face in the future. Please join me in giving a very warm welcome to a very special guest, Ambassador Heraldo Muñoz. HERALDO MUÑOZ: Thank you, Joanne, and thanks to the Carnegie Council for inviting me to talk about this book, which truly, I must say, I never intended to write. It was the executive vice president of Basic Books who lobbied me to write it, because he knew my CV, knew my life’s trajectory, and thought that my story deserved to be told. I told him initially that I couldn’t do it, that I wouldn’t do it, because I’m not a historian; I’m a political scientist—more of a political economist. Pinochet has touched so many aspects of contemporary life, and so many individuals are associated with him, when you think of it—Henry Kissinger, Richard Nixon, Margaret Thatcher, Richard Helms, Fidel Castro, Leonid Brezhnev, Milton Friedman. These are a few that come to mind that were influential, in one way or another affected by the policies of the countries where these leaders, these opinion-makers, led or where they lived. So in the end, he convinced me, and I wrote this book. It was remembering a painful period of my life, because the book begins the day of the coup, our 9/11, 9/11/73, the day the democratic government of Salvador Allende was overthrown by force, led by General Augusto Pinochet. I tell the story of what I did that day. I tried to write a book that would be lively, that would convey to the reader not the academic analysis of a period that could be found in other publications, but rather my own memoir. That day I went to pick up some dynamite. I had some paramilitary training, and I knew how to use explosives. I went to pick it up at the house of a friend where we had stashed it away. I had given him specific instructions on how to do it. Dynamite has to be turned upside down several times during the month, because otherwise, in the technical term, dynamite “sweats.” In other words, the nitroglycerine seeps out, and it becomes highly volatile and can explode with movement. He sort of cried. He was too nervous. So I put the dynamite around my waist, in the belt, together with a .32-caliber gun that I had and went to meet other friends. I tell what I did that day and how hard it was for those of us young people who thought that we had to defend democracy and that we had to defend the constitutional government. Looking back, it was an extremely responsible thing that we did, but it was a cause that we were defending. I was willing to die. Even my wife, who is an American, says that at that time there was a moment when it would have seemed that the political cause was more important than her. I told her that was never the case, but I was simply responsible because of the things I did and that I tell in the book. I was lucky at times. I recall, about two years ago, Barbara Walters, a good friend, invited me to a dinner at her apartment in my honor and invited a group of friends from media, business, et cetera. A movie had been shown in New York theaters called Match Point, by Woody Allen, where the role of luck or fate defines the lives of individuals, one way or the other. There was a series of very interesting stories, until it came to me. I was the last one, to her right. I told the story, during those days, of when the military came to pick me up in my house and all of a sudden, I saw what seemed like a whole battalion of army people that blocked the street. I saw machine guns. Out of the window of my mother’s house, where I lived at the time, I saw two friends of mine that already had been detained in a truck. I saw a lot of movement, a guy with a .30 machine gun, one of those big ones, in front of my door. They wouldn’t come in, until about 20 minutes later, all of a sudden a lot of movement and they leave. They had gone into the wrong house. They had gone to the house next door, which belonged to a family who knew my mother for 30 years. She had been brave enough not to say that I lived next door, and I was saved. They ransacked her house, because they didn’t believe that I didn’t live there. Eight years later, I met one of the guys who was in the truck in Mexico. He embraced me and cried and said that out of those horrible days, the only happy moment was when this dumb military went into the wrong house and they came out without me. He said, “They were so mad, because they really wanted you.” They had bad intelligence. They just had gone into the wrong house. I tell you this story, which is in the book, to highlight something that happened to us Chileans. We lost our innocence then. We were the most civilized country in Latin America. We thought of ourselves as the “Englishmen of Latin America” (or the English persons of Latin America). All of a sudden we had a dictatorship—and such a cruel dictatorship. On the day of the coup, 36 people died. There was no resistance. Those young people like me that went out with ridiculous .32-caliber guns against weapons of war had no chance. There were 36 people that died, including some military men, in the confrontation, basically in the palace. Some of you may have seen—and it may be in your mind—a smoking presidential palace. But what happened was that by the end of 1973—in other words, three months later—2,000 people had died, had been massacred by the repression. That signaled a period of terror by Pinochet, who had not been the leader of the coup. The coup had been led by others. In fact, he had been named army commander-in-chief by President Allende supposedly because of his loyalty. So he played both sides. He always was during his career a very mediocre individual, who cultivated friendships to get ahead in life and his military career, and who resisted the coup until he saw that in the other branches of the armed forces there was so much support for a coup that he was going to be shoved aside if he didn’t join it. He did join at the last minute. At that time, the terror that he unleashed against those of us who thought differently, who had been with Allende, was because he wanted to assert power in the country and within the armed forces. He was giving a signal to the armed forces as well. But Pinochet was, among other things, and perhaps above all, a pragmatist. Here is the other Pinochet that emerges—not only the ruthless Pinochet, the one of torture, of exile, of assassinations, of the disappeared, but a man that, confronted with the fact that he has a government and he has to have an economic policy to implement, in a country that had been polarized and whose economy had been destroyed—basically, the Chilean economy had runaway inflation, hyperinflation. The economic policy of the Allende government had been a misguided policy of controlling prices, which led to the black market. Increases in production, in productivity were minimal, and economic chaos reigned in the country towards the end of the Allende period. So he had to do a new economic policy. He had no one to rely on, and he thought that this general, who had some accounting courses, could be minister of the economy. But the navy was thinking better, and they brought this plan by these young men who had studied at the University of Chicago—most of them got an MA, some PhDs, some studied with Milton Friedman—and he had no alternative. He preferred his accountant friend, but these young men, backed by the navy, had a plan that seemed to work, that was rational. And pragmatist that he was, he went with that free-market policy, even though he himself was a nationalist. He was a statist, as the army in Chile always was. But he went into opening up the economy, liberalizing prices, privatizing state companies, and doing “shock economy.” He went that route. Milton Friedman went to Chile and recommended shock therapy. He said that when you cut the tail off a dog, you don’t do it little by little; you do it with one chop. That signified that when the Chilean economy dropped about 35 points. Unemployment was rampant. But slowly a recuperation began—slowly. 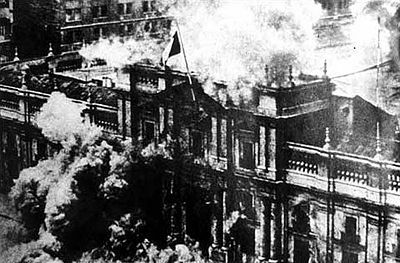 At that time, we Chileans who were in the opposition tried to survive. We went into hiding, with my wife, for about a year and a half, going from one house to another. I tell all the stories. The only year in our 30-some years of marriage that I forgot her birthday was when we were in hiding. I can almost not forgive myself yet. But we went from one house to another in hiding, sometimes trying to connect with others in the Resistance, trying to put out pamphlets. Military resistance was ridiculous at that time. It was committing suicide. At that time, my wife decided that we had to leave, and at the end of 1975, I came to the United States and took advantage, on the counsel of a friend, to do a PhD. They said, “You can leave legally.” I had been asked to go into an embassy and seek asylum. I said I would never do it. I would rather fight than go into an embassy, because I knew I would go into exile. I left legally, and I came to the University of Denver, to the Graduate School of International Studies, where I met marvelous people, like Joe Korbel, who was my professor-guide and who was Madeleine Albright‘s father. My classmate and good friend was Condi Rice, who became a friend and continued to be a friend, even though we have had some issues where we have differed in the past. But I continue to speak very highly of her. I went back three months before her. Of course, I got into political activities, got arrested, got beaten up, broken fingers, out of which I still have some remembrances in one of my hands. But slowly we began organizing. In 1982, the economic model, the orthodox Chicago model, goes down, in a situation that reminds me, by the way, very much of what happened a couple of months ago here in this country. There was no regulation of the banking sector, at a moment when Paul Volcker in the United States decides, under the instructions of President Reagan, that inflation has to be controlled. So he begins to control the money supply, the interest rates. Then the money that was flowing into the international economy dries up and the money then is not coming to Chile. At the same time, they had fixed the currency at a certain number of pesos. With no control of the banking system, the banks were loaning to their own related companies, some of which were not real companies, speculating, and doing other toxic activities. That meant that the system began to go under, and Pinochet had to rescue it and had to nationalize. Basically, like Greenspan is saying now, maybe it has to occur once in 100 years. Well, it occurred in Chile. It was nationalized by Pinochet. Allende, who was supposed to be a socialist, would never have thought to have all the banking system in state hands and providing a bailout package, equivalent to about $20 billion today, for Chile, a small country. That crisis allowed us to organize better. We began with protests. We began going out into the street. National protests were a beauty. At night we would go with pots and pans. The first night, it was to begin at 9 p.m., and we didn’t hear anybody, no neighbors. All of a sudden begins a beautiful cacophony of noise, all of Chile protesting against Pinochet. But he was a hardliner. He abandoned the Chicago model. He took in a neo-Keynesian economist. But since he was a pragmatist, later on down the road, in the late 1980s, he went back to a much more moderate version of the Chicago school—much more moderate, with protectionism here and there, with subsidies here and there, and with good regulations of the banking system. So the economy began to recuperate. By that time, we, the Chilean opposition, had gathered speed, and we beat him in a plebiscite in 1988, when he thought that he would win. Everybody had told him so. We took the risk of participating in a plebiscite. The Los Angeles Times asked me to write a piece about what to do about the plebiscite. I said, “We have to participate,” and I wrote an article about participating in the plebiscite. It was quite risky, because it was playing according to the rules of the game with Pinochet. I remember that in a lecture I gave at the University of California at San Diego, some people had read the article and called me, basically, a traitor. The nicest thing they said was that I was naïve. But we participated in the plebiscite, and we won the plebiscite. And that was the end of Pinochet, in a sense, because what came was the challenge of governing while Pinochet was still commander of the army. They thought it was the real ruler behind the throne. Here I want to say one more thing before I finish. “What is the U.S. role in all of this?” you may be thinking. The United States—this story is very well known—under the Nixon Administration had sought to impede the accession of President Allende to power. He had been elected with a plurality. He had to be confirmed in Congress. The CIA designed a two-track policy, approved by him personally and by Kissinger. The first one was to try to buy a few of the congressmen, so that they would vote for the runner-up. That didn’t work, because the tradition in Chile was simply that Congress confirmed the candidate with the highest plurality. Second, a military coup. The CIA provided weapons, explosives, and money to a group of military and civilian right-wingers. That went bad. They tried to kidnap the commander-in-chief of the army at the time, to blame it on the left. They killed him, instead of kidnapping him, and there was an outcry for democracy and for the confirmation of Allende. After that followed an invisible blockade, basically. The idea was “to make the economy scream,” as Richard Helms wrote on his pad at a meeting in the Oval Office. The interesting thing is that the only CIA chief that has ever been indicted for anything in the history of the United States has been Richard Helms, for not telling the truth to Congress. So it was a very bitter period, where the United States embraced Pinochet immediately after the coup, and the perception in Chile and in the world was that this was a U.S. coup. It wasn’t, because there was polarization in Chile. We were guilty of the coup, because we polarized the country. We socialists and the communists thought that we could do revolution with a plurality, while the right, opposed to any change and wanting to preserve the status quo and the center, instead of playing the pragmatic role, became intolerant. And the country polarized. So we created Pinochet, but the United States was clearly the sponsor of the coup and they made everything possible. The interesting thing is that the policy of the United States changes with Carter and changes with Ronald Reagan. As you recall, at the time Reagan pushed the policy of democracy and human rights, thinking of the Soviet Union. But he couldn’t overlook what was happening in Latin America, and he was worried about Central America. So he gave Pinochet the chance of quiet diplomacy with Ambassador Kirkpatrick. But Pinochet thought, “I have an ally, an anticommunist. I don’t need to do anything about human rights,” and he kept on with the repression, until Reagan got tired of it and sent a message that he was going to change the policy. In the end, the greatest support that we had in the plebiscite, in the mobilization against Pinochet, was from the U.S. government headed by President Reagan. So it was a policy that was not without shades of nuance on the part of the United States. The United States played a very constructive role, under President Reagan, to favor the reinstatement of democracy. The political landscape in Chile changed because of all this. The communists drew the wrong lesson, drew the lesson that you have to have military power and that it was naïve to try to build socialism through democratic means. That was because Leonid Brezhnev told them, in the 25th party congress—the head of the Chilean Communist Party was there—that a revolution that doesn’t defend itself does not deserve the name of “revolution.” So basically he was saying, “You guys were not prepared, and even you were sort of cowards, because you did not take up arms,” influenced also by the Sandinista revolution and by Afghanistan. I’m sure—and I argue this in the book—that the Soviet invasion of Afghanistan was because they did not want another Chile. So the defense of the Najibullah regime in Kabul, the invasion, was because they did not want an Allende to occur and the influence of the Communist Party to disappear, as they had in Chile, much closer to the borders than down there in the South Pacific. That’s the lesson that they drew, and the Communist Party in Chile began armed struggle. They tried to assassinate Pinochet in an episode that I tell in the book. I knew some of the people that participated in that assassination attempt. We drew a different lesson. We drew the lesson that the only way was peaceful cooperation with all democrats, even conservative democrats, because they were in favor of human rights and democracy and the rule of law, the reinstatement of the rule of law. And that’s what we did. We drew the lesson that Berlinguer, the head of the Italian Communist Party, draws of Chile. He says that Chile demonstrated that you need a historical compromise between the center and the left. Out of that, Eurocommunism emerges. That’s our lesson, how we coalesced and created the government coalition today, where there are the Christian Democrats, who are the adversaries of Allende, together with the Socialist Party and other parties. The other reflection is, what about the economy? My feeling is that Pinochet’s policies laid the foundation for what has happened today. He deregulated parts of the economy, which had been very statist in Chile. He pushed the economy towards an export orientation—not only copper, but nontraditional exports. He gave opportunities for Chileans to begin to be entrepreneurial, so that now any Chilean who wants to can export anything. We export all kinds of things to the world. We never exported salmon. Now we are the second major exporter of salmon. In the 1980s, the experiment began. We export more kiwis than New Zealand. We used to import them from New Zealand; now we do better than them in terms of covering the world market with our kiwis and fruits and all kinds of other products. So that came out of the Pinochet era. But the real miracle, in my view, occurred when democracy came back. The results were better. We reduced inflation to one digit. Pinochet was never able to do that. We increased the rate of growth to about 6 or 7 percent for two decades. We doubled Gross National Product in ten years. We reduced poverty from 40 percent of the population, at the moment of the return of democracy, to 13.2 percent right now. We eliminated extreme poverty. We reduced income maldistribution. In essence, we turned into a miracle, in the midst of unions that were able to protest, a congress that was able to “fiscalize,” a press that was able to criticize, political parties that were able to mobilize, and people that were able to complain, as they usually do, even if things are going well. So that is the miracle. The miracle is to have done that in democracy, with all the limits and the beauty of democracy. Pinochet was part of it. Yes, he was part of it. You have to look at your history, with the good and the bad. But in the end, I think history will judge Pinochet more as a ruthless dictator, as a violator of human rights, as the individual that dared to come to the United States and perpetrate a terrorist act in the streets of Washington by assassinating Orlando Letelier and Ronni Moffitt on Massachusetts Avenue, a mile away from the White House. He will be remembered as someone who sent terrorists to kill a former commander-in-chief in Buenos Aires, who sent terrorists of the secret police to kill people in Madrid, in Rome, and in other countries. I think he will be remembered a lot more for those acts. For sure, he marked a generation. He marked me for sure, and I have met numerous leaders throughout the world, like Jack Straw, Tony Blair, and some German ministers I have met in my life, who said, “Well, I began to be involved in public affairs because of the solidarity with Chile in the streets.” So it marked a generation. It’s a page turned, but I thought that this story deserved to be told. JOANNE MYERS: I think one of the other reasons this book is so compelling is because it’s Ambassador Muñoz’s reconciliation with the past. That makes it really an interesting read. Now I’d like to open up the floor to discussion. QUESTION: I want to ask you to offer some reflections on the attempted prosecution of General Pinochet, whether you think Jack Straw, first of all, did the right thing in deciding not to have him extradited to Spain. Secondly, what you think might have happened in Chile had Pinochet not died. Would he have been convicted? Would that have been a plus for democracy in Chile? Do you think the effort to prosecute him is an important message for other dictators in the world, even though he died without finally being convicted? HERALDO MUÑOZ: I think the last part of your question is the real relevant conclusion that one should make. I thought it was an important episode, in the sense that Pinochet at the time had retired, finally, from the army. I didn’t talk about many of the episodes that are in the book that occurred during the first two democratic governments, where Pinochet was always there, moving the rug under the feet of the presidents. I interviewed the presidents. There is some rich literature there, a lot of anecdotes. But after that, he had written into the constitution that he would become senator for life. So he went to the Senate and he became a man that tried to build a statesman image for himself. He was unable to do so, because it was too short a time, when he went to London. He loved London. He said it was the only city where there wouldn’t be these long-haired protesters against him. He loved it. He would go to Harrods and buy maps and go to the army museum, et cetera. He was picked up because, as you know, a Spanish judge conducting an investigation into the assassination and disappearance of the Chileans actually wanted to put questions to him. I have gotten this story. I spoke to the judge at length several times. He never intended to arrest Pinochet in London. What happened was, Scotland Yard said, “Look, he’s leaving, so the only way for you to send the questions to him is for us to detain him.” So then he gave the order of detention, thinking that this was not going to happen, and it did. It changed history. Clearly, the Law Lords, in their judgment, in their ruling, said that there was no immunity for former heads of state. That, I think, was a very important step in international law. It was a warning to former dictators they would not get away with impunity, if they think of leaving the country at least. That has continued to be the case. That, I think, together with the creation of the International Criminal Court, created a regime, I think, that was thanks to the Pinochet detention. When he went to Chile, yes, there was a lot of politics behind it. It was really a thorny issue for the U.K., for Spain, for Chile. They decided that, for health reasons, they would send him back. There he was put under house arrest, a trial process by a judge for several cases. He died under house detention, but he was never actually condemned. So that is sort of a bittersweet ending. But at least, I think, the London episode was a major, major step in international law. QUESTION: We are fortunate that you are not only an active participant, but also an acute observer and analyst. In that role, could you comment on some of the other developments in Latin America, where the trend towards democracy has been strengthened, but, of course, there are many problems, which you know about more than others? Since you mentioned a plebiscite, just recently Venezuela had a plebiscite, and Chávez won, which surprised many of us. Could you broaden the discussion somewhat and give your reflections on what’s happening in Latin America today? HERALDO MUÑOZ: The first thing I would say is that one should not draw a conclusion that Latin America is going in solely one direction. I read a year ago a headline in a newspaper saying, “Latin America Is Going Red,” because of the election of Correa in Ecuador, of Chávez before, of Evo Morales in Bolivia, as well as the return of Ortega in Nicaragua—by the ballot, not by the bullet. I think Latin America is going into all of the colors of the rainbow. Iff you look at what has happened in the last couple of years in terms of elections, you have a president of Mexico, Calderón, who is a conservative, I would say; Óscar Arias, a moderate centrist, in Costa Rica; you have the four presidents that I have mentioned, various shades of left populism; my own president, who is a Social Democrat; Lula, who is a Social Democrat; Alan Garcia, who is a new Alan Garcia, more of a conservative, particularly in economic policy, in Peru. So Latin America is not going in any particular direction. What is happening, though, is that, increasingly, heads of state are falling into the temptation of reelection. Somebody said yesterday to me that there is “revolution by constitutional change.” The constitution is being changed in many countries, not only in Venezuela. The constitution was changed in Colombia to give the possibility for President Uribe to reelect himself. The constitution was changed in Brazil to allow for Lula’s reelection. The constitution was changed in Bolivia as well. If you look at Latin America, there have been many constitutional changes precisely to allow sitting presidents to reelect themselves. That, I think, is a complicated tendency, but it goes from left to right. If the people, in the end, vote for it, if there are controls on the process in the plebiscites, if there is a level playing field so that those that say no versus those that say yes exist, then it is up to them to do it. We have to be watchful, though, about the rule of law. That, I think, is the key. It is not sufficient that a president is selected democratically. He must continue to rule democratically. Then the international community has a responsibility, particularly in Latin America, because we wrote a charter, a democratic charter, that I was involved in that says precisely that there is a right to democracy in the Americas. We have a long tradition, and we have to be very watchful about how the democratic process at some point can turn into something that is less than democratic. Then we have a responsibility. But I think, as everybody says, at least Chávez won fairly. Who knows what the future will bring, though? QUESTION: Mr. Ambassador, you alluded to the concern that President Nixon and Henry Kissinger had towards the ascent of Allende. Of course, they were looking at Cuba. They were concerned about another beachhead being established in Chile. To what extent were the Cubans, or any other communist countries, involved in supporting Allende behind the scenes? Was the concern on the part of the American government justified, given what you know now? HERALDO MUÑOZ: If you ask me whether the U.S. concern was justified, I would say, clearly, no. There is a very nice book called Nixon and Kissinger, written by Robert Dallek, where he demonstrates something that I already knew, but he demonstrates it with a lot more detail and documents, and that is that President Nixon and Secretary Kissinger dedicated an inordinate amount of time to Chile, an unbelievable amount of time, if you think of the challenges that they had: the Middle East conflict, the SALT talks with the Soviet Union, the opening to China, the expansion of the war in Vietnam. Evidently Kissinger is smart enough that I think he was being rather sarcastic when he was saying that. But Dallek demonstrates meeting after meeting the inordinate amount of time that Nixon dedicated to Latin America. He received people that a president shouldn’t have received, with the little time that they had, given those policy changes. I think there was no justification. Chile was not going communist. We were simply a coalition that had to do a program. But about Cuba, yes, Cuba supported Allende very strongly, because Fidel Castro was good friends with Allende. But what does “support” mean? He went over and spent a month in Chile visiting. There was a moment when there were no places we could show him, because he stayed and stayed and stayed. He sent some sugar when there was a necessity. But beyond that, what type of support? At the same time, Allende was very good friends with Nelson Rockefeller. There’s a story that I tell in the book. This was in a conversation that I had with Joe Korbel in Denver, when we talked about the differences between socialists and communists. He was a very good friend of Nelson Rockefeller. During the Second World War, when Allende was a senator and Rockefeller was sent by the president of the United States to try to pressure Chile and Argentina to break relations with the Axis powers, Allende was the one who hosted Rockefeller and gathered political forces to push the Chilean government to break relations with the Axis. They didn’t want to, because there was a large German community in the south and the sitting government did not want to get into political trouble by breaking relations with the Axis. And there was Allende with his friend, Nelson Rockefeller. It was because Rockefeller had helped Allende when he was minister of health in 1939 and a friendship had been built. So Allende was friends with Rockefeller and was friends with Fidel. With Fidel, he had political affinities. With Rockefeller, he had more personal affinities. But it was absolutely unjustified. It was one of the great errors. He did not understand how the United States operates and that no administration, be it Democratic or Republican, was going to accept the perpetration of an assassination in Washington. He never understood that. QUESTION: I wonder, Ambassador Muñoz, if we could explore a bit your recollection of Chile at the turn of the 1970s, having become very deeply polarized. It always had the reputation of being an almost-200-year constitutional republic. The Kennedy–Johnson people had hailed the election of Eduardo Frei of the Christian Democrats in 1964 as the kind of new frontier-style “great society,” a middle way. Yet by the end of the decade, you had young people like yourself who were agitating for much more radical change, and Frei’s party successor, Tomic, came in third, I think, in the 1970 elections. Somehow, inside the military, there was incubating a virulent kind of right-wing extremism that then exploded when Pinochet took over. What were the stages of the polarization in Chilean society that drove folks to either end of the spectrum? Is Chile today confident that you would not find such polarization down the road again? HERALDO MUÑOZ: I can begin with the last part, because it’s easy. Yes. We wouldn’t find the polarization now that we had in the late 1960s and early 1970s. I think we learned our lesson. Playing along with the rules of the democratic game is something that is very ingrained in Chileans now. The tragedy that we had, at least in my generation and the following generation, is very fresh, even to young people. Since this story of Pinochet and the dictatorship and Allende is repeated through the media and through informal channels, I think it also penetrates to the younger generation. So by no means are we going to go back. Chile is a safe, stable country. How did that happen? I think it happened because of the effects of the Cuban Revolution. When you see the movie Che today—it’s very long, four or four and a half hours—you realize that those were the times in the region when corrupt dictators ruled in the region, and Chile was a haven of civility. All the exiles came to study in our universities. We had the highest literacy in the region. We had good health policies, et cetera. But we were affected by what we saw in our neighborhood. But it wasn’t only us. Think of 1968, 1969, 1970. In 1968, there was the Democratic Convention in Chicago. There were protests in the streets. I came to the United States around that time, the first time, and I saw the civil rights movement, the violence, the cries for change, the hippie movement. In 1968, Paris was rioting. There was a war in Vietnam, protests throughout the world. So the world was in upheaval in the late 1960s. It wasn’t just us. We were part of a world scenario that wanted change, and that wanted change rapidly. We did it our way, because we elected a socialist. We elected him by the ballot. But we bought ourselves the dreams that many were dreaming that we could build socialism, despite the fact that more than half of the population in Chile had not voted for Allende. We went well beyond the economic program, and we began, then, to dig the grave of our own death of the political process. I went to talk to them, and they were mostly women workers who had been pushed by some activists of my own party to nationalize the blue jeans factory. The owner said, “You’re going to pay for this,” and they came with weapons to defend. The company ended up in the hands of the state. Can you imagine? A micro-enterprise of 33 workers ended up in the hands of the state, nationalized, in the state area. So those were the crazy moments that were occurring. But I think we were all a bit crazy in the world at that time. It was not only Chileans. QUESTION: Since Obama was elected president, has there been a more positive attitude towards the United States by Latin American countries? HERALDO MUÑOZ: I would say that if the election had been conducted in Latin America, Obama would have gotten 95 percent of the vote. Great enthusiasm for him. I have never seen so much press talking about a U.S. election. I received dozens of calls from TV channels, from radio stations, newspapers, about my opinion on how I was seeing the political process, since I was here in New York. I’m sure that others did as well. So there is an unbelievable interest. I see it among my colleagues at the United Nations as well. If you do a poll among them, easily 80 percent are going to say that they love Obama. They love what he’s saying. There’s also the message that he just gave by naming Ambassador Susan Rice and putting it back in the cabinet, recuperating the same level position that it had under the Clinton Administration when Madeleine Albright was also a member of the cabinet, meaning that she would have direct access to the president, and at the same time, signaling that the United Nations is going to matter. So there is a very positive attitude. That doesn’t mean that there won’t be differences over country policies. At some moment, on some issues, there will be, for sure. But I think he has so much capital already of goodwill that his honeymoon in Latin America will last a lot longer than the honeymoon with the Republican Party and the economic package. QUESTION: You said that the real miracle of Chile included income distribution becoming more equal. That was the only thing that slightly surprised me. I wonder, is there clear data on that? I don’t think it has continued in the last 10 years or so. At least the studies I have seen recently suggest that in Ecuador, Bolivia, Venezuela, income distribution has improved, possibly in Brazil, but not in many of the other countries. I would like you to comment on that, because income distribution is surely the Achilles’ heel of so much of Latin American economic policy. HERALDO MUÑOZ: Yes. I think you’re right. Income distribution has improved in Chile, but not in a way that we would be satisfied with, and other countries have done better in that sense. So you are correct. When I mentioned income distribution, it was because it has moved, while it hadn’t moved at all previously. The gap had actually widened during the Pinochet period. Now it has been reduced. But the Gini coefficient is still far from ideal. So the data is encouraging, but not satisfying. In other countries, as you say, they have done much better. What happens is that, even though we have eliminated poverty in a major, major way, at the same time the creation of wealth is so great in Chile. Now our GDP is about $140 billion, which is amazing when you think that we have tripled our income in two or three decades, and income per capita, PPP, is a little bit over $13,000. So we have done very well, but still we have a problem in income distribution. You are right about that. JOANNE MYERS: I want to thank you for a very stimulating morning. It was really terrific.